Ambassador to the Russian Federation, Dr. Dayan Jayatilleka met with Senator Dr. Andrey A. Klimov, Deputy Chair of the Federation Council Committee for Foreign Affairs and Chair of the United Russia Party’s International Relations Commission which is a part of the United Russia General Council Presidium, the party’s supreme governing body at the Federation Council, Upper Chamber of the Russian Parliament, on Wednesday. 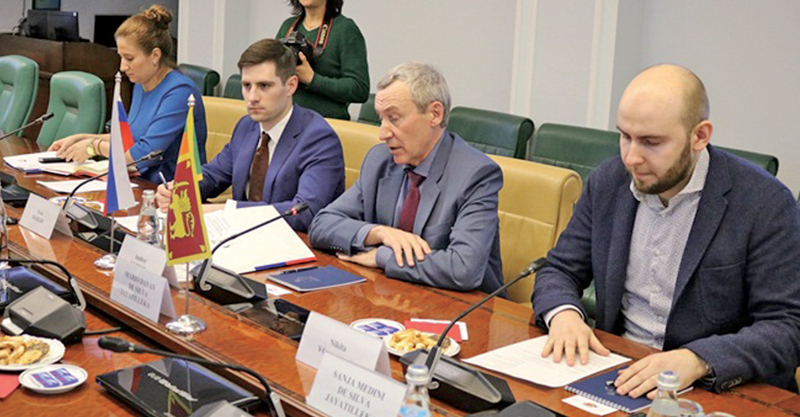 Senator Klimov has been the Chair of the Federation Council Commission on State Sovereignty since its establishment in 2017. They exchanged ideas in advance of the Senator’s trip to Colombo, for ICAPP, followed by his participation in the Interparliamentary Union Assembly in Doha.